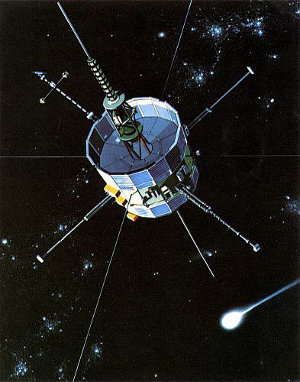 The International Sun-Earth Explorer-3, or ISEE-3, was launched in 1978 by NASA to monitor activity on the sun. After three years of observation, NASA repurposed the satellite, which soon became the first spacecraft to visit a comet. The mission ended in 1999, when NASA abandoned ISEE-3 to orbit the Sun, despite the fact that twelve of the satellite's thirteen instruments were still working. In 2008, when it was discovered that the satellite was still transmitting a signal and would fly close to Earth, NASA realized that they no longer had the funding or equipment to reinitiate contact. So a volunteer group of scientists, programmers, and engineers organized the ISEE-3 Reboot Project, which was crowd-funded with over $150,000 in donations, and set out to contact the spacecraft, fire its engine, and bring it closer to Earth to resume its original mission. To do this, the group turned to GNU Radio, a free software toolkit for implementing software-defined radios and signal processing systems. Modifying the software to communicate in the 1970s satellite protocol, members of the reboot project were able to gain access to the spacecraft and fire its thrusters in early July, and will soon attempt to move the satellite into an orbit close to Earth. You can support GNU Radio by making a donation through the FSF's Working Together for Free Software Fund. To get more involved, attend the annual GNU Radio Conference, to be held this year between September 15th and 19th in Washington, D.C. The successes of the ISEE-3 Reboot project demonstrate the importance of developing, maintaining, and promoting free software. With dozens of contributors and thousands of users, GNU Radio is written to be shared, learned, and improved by anyone, anywhere -- unlike the lost proprietary communications equipment used by NASA. This is the second time we've lauded the use of free software for space exploration in the last two years. Read our 2013 blog post about the choice of GNU/Linux as the operating of the International Space Station. "This openness to inquiry, collaboration, and 'standing on the shoulders of giants' is at the heart of all science," wrote John Gilmore, a founding member of the GNU Radio project, in an email to the FSF. "The GNU Project has institutionalized those principles in a vast community of software authors and users. And GNU's legalized freedom and sharing [...] enable many people to use it and contribute to it -- such as these volunteers."